What is this thing we call spring? Is it defined by date, by temperature or by what we see around us? Or maybe it’s just a feeling, something inside us that yearns for the end of the dark and cold of winter. Meteorological spring begins on 1st March this year but, in a week in which fearsome sub-zero temperatures and snow are forecast for much of the UK, it will feel like winter is still surrounding us. Today was indeed bitter, with a raw wind that penetrated even the warmest of coats, but the fresh, crisp air and bright blue sky proved too much temptation for me, and I spent the afternoon in the garden. I pottered contentedly, sweeping leaves and re-stacking the untidy log pile; I peered closely at beds and borders, watching the cold earth and weak sun nourish new green growth. Magnolia, clematis and rose are budding tentatively, stretching out towards the light, and I couldn’t help but imagine the flowers to come and the warm weather that will accompany them. Our apple tree has sprouted a few new leaves, although they were quite hard to spot on its gracefully arching silhouette. I spied a nest in amongst the logs. Whoever has built this (any ideas?) has assiduously ignored our deliberate wildlife haven – a tumbling pile of large log slices from a fallen tree – and plumped instead for the logs destined for our cottage fireplace. Fear not, wee creature, we will work around your little winter home, and select our firewood from the other end of the log store. January can seem endless; its thirty one days are short on daylight hours, but they feel long, so long. 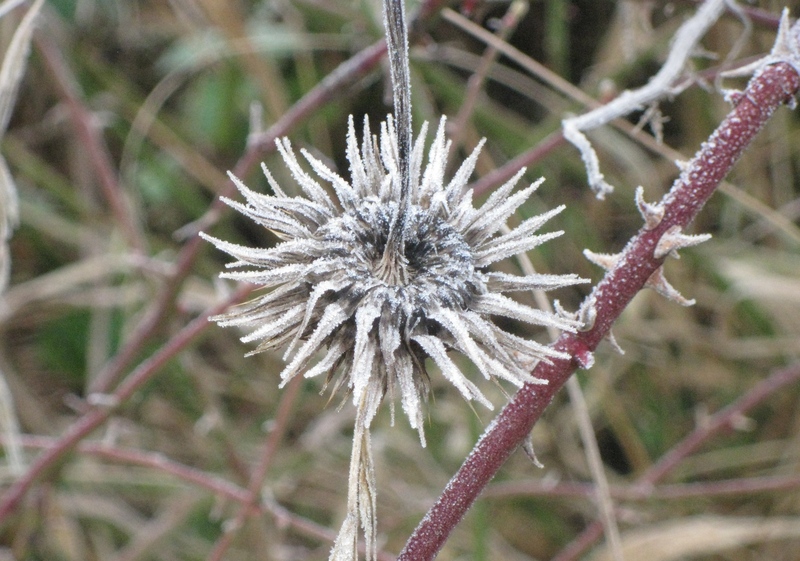 Winter is the season when nature sleeps and quietly regenerates, but life, growth and abundance are never far away. 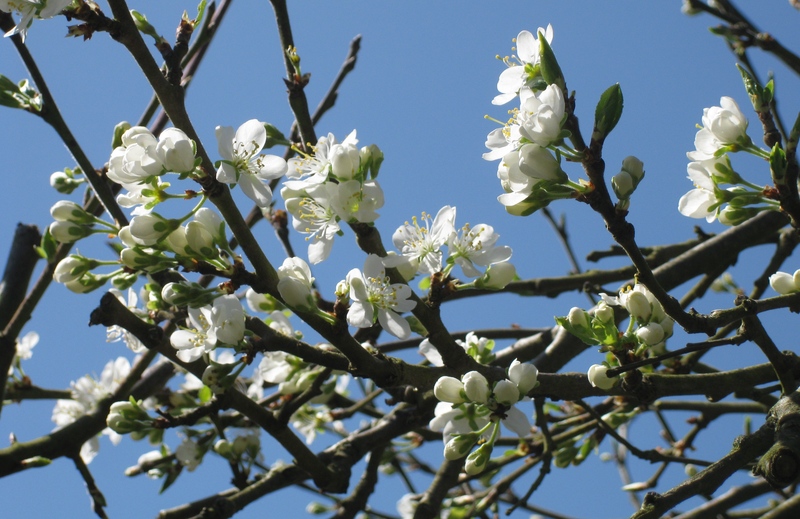 Spotting the early hints of Spring, especially on a clear, crisp, sunny day, is one of life’s great treats. As January turns into February, bulbs push up from the ground and catkins hang from bare branches with a pop of yellow. Snowdrops by the hundred adorn our village with banks of bright white and green. The oak trees retain memories of Autumn with old leaves and acorn cups hanging on to the branches, while simultaneously showing off their new Spring buds. Long-time readers of this blog will know that I have a favourite oak, a mile or so from my cottage. I visit him almost daily, to commune with him; his venerable old bark dusted with lichen in a pale Farrow & Ball hue; his proud branches framing the lane with an elegant late Winter silhouette. The village pond is looking a little sad, its water level low despite all the rain we’ve had, and swirls of algae covering the surface. For some reason, a terracotta cat-shaped planter has appeared on the bank, and my dog thought this curious addition worthy of investigation on our walk. Flaming shards of dogwood frame the village green, punctuated by tiny bursts of pink spindle berries. Spring is not yet with us, but these vibrant stems glow with warmth on even the coldest February day. As I write this, rain is hammering down outside, but this morning… Oh! This morning, how glorious it was. 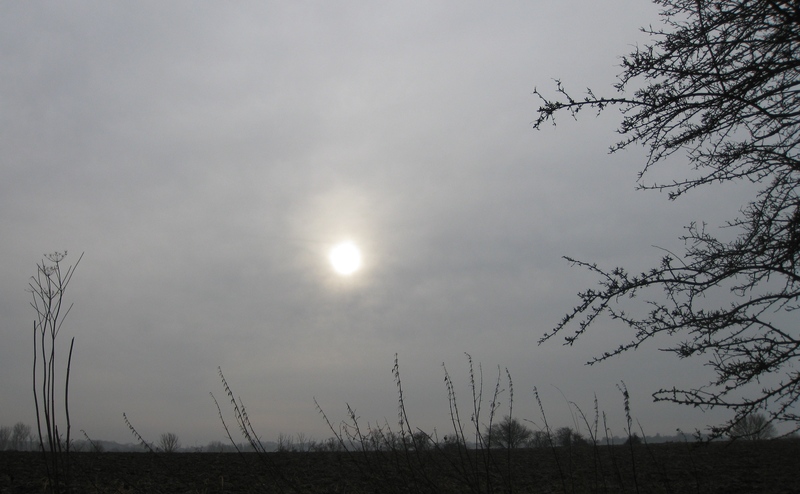 The sun shone, albeit thinly through low, pale clouds; a thick frost was crisp and glistening underfoot; ploughed furrows and tractor tyre tracks were chilled solid, having been deep mud just a few days ago. 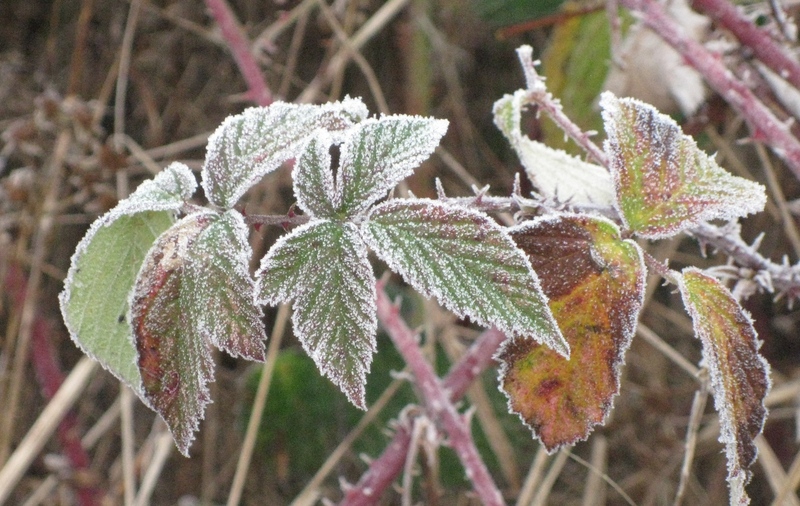 A long walk with husband and dog took us along footpaths and field edges; the horizon shrouded in winter mist; puddles frozen into Hockney-esque ice patterns; hedgerows draped with frosted lace. We glimpsed remnants of summer’s fertility in leaves and berries, seedheads and burrs; and the occasional flash of bright green lichen or ivy shone out of the monochrome landscape. Suddenly, in the middle of a sugar-frosted ploughed field, a hare sat for a moment then ran, a blur of brown and white, tipped with black; our border terrier stood transfixed (back on her lead, lest she gave chase!) until it was out of sight. 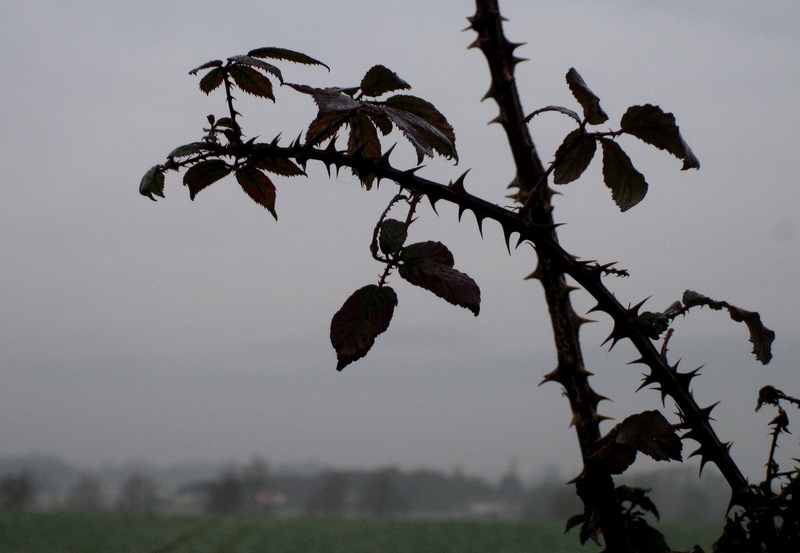 In the next field we spotted a deer hurtling back into a copse, away from the dangers of the open countryside. The furthest point of our walk took us on a footpath around the fields of a livery yard. We stood for a moment, watching the ponies munching on frozen grass and wisps of hay, before retracing our steps along the bridle path that leads home. Is there any better way to spend a day than pottering in an Autumn garden? I think not, especially as we are enjoying some agreeably mild weather at the moment. There is a hint of chill when the sun disappears, though. The times they are most definitely changing and the fourth season of the year will soon surround us. Until then, I can think of nowhere I would rather be than in my garden, beginning to tuck it in, ready for its winter sleep; raking and rustling through a few leaves – always an enjoyable but futile pastime, given the number of leaves still on the trees; filling a bucket with windfalls and the last few apples picked from the tree. Relishing the vivid reminders of the garden’s summer glory with a flurry of cosmos, a Ruby Glow sedum and a single, fragrant rose (Tess of the d’Urbervilles, since you asked so nicely); finding the face of an owl (photo-bombed by my dog’s paws!) in the log pile; and then sitting with a cup of hot coffee and a homemade flapjack, as the light starts to fade and that chill descends. At the end of a beautiful late summer day, one that was blessed by warm sunshine, a cloudless sky and a light breeze, I took Katy-dog for a walk along the lanes around our cottage. Whilst autumn is not yet in the air, summer is definitely feeling a little weary and is ready for a rest. The farmed crops have been harvested and the wild crops have given of their best to the pickers and foragers – blackberries and elderberries, sloes and wild cherry plums. Late to the hedgerow party are the rosehips, just beginning to glow deep orange amongst the green. I feel some rosehip jelly coming on! There was plenty of colour down on the ground too. I wandered slowly so I could spot each wildflower nestling in the verges or peeping from the edge of a field. From pure white through blush pink to deep purple, with the occasional splash of red from a late poppy; many of the flowers hosted an insect grabbing an evening snack and some of their leaves had clearly fed a few hungry mouths too. Katy caught the scent of something good in the cool air. Was it a sausage on a distant barbecue or the wild rabbits coming out for their evening constitutional? I let her sniff on, enjoying the concentration on her face as she inhaled and savoured every molecule. Shortly after we returned home, the sun and sky put on a breath-taking performance to end the day, and the weather vane on our shed roof pointed to another gorgeous day ahead tomorrow. I would be hard-pushed to choose my favourite season; all of them have their own special qualities and characteristics but, if I had to pick one, I would plump for spring. The gradually lengthening days, the unique brilliance of the sunlight and the promise of warmer days ahead (even if the thermometer still hovers around the lower reaches) make for a time of irresistible optimism. And how can you not be optimistic when everything around is coming back to life or starting a new life? Plants that have laid dormant over the winter push back their duvets of soil and stretch out towards the sun; bulbs that have slept since the autumn burst into flower seemingly overnight; and seeds, newly planted, begin their astonishing transformation from teeny dot to mature plant in a matter of weeks. 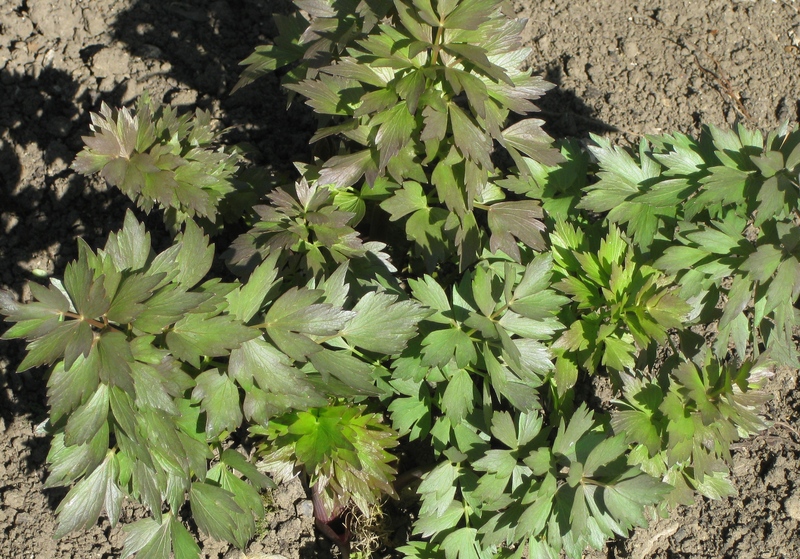 And my beloved lovage – which fools me every winter into thinking it has died – has reappeared, stronger than ever. This was a cutting from a huge, well-established plant in my previous garden. I brought its offspring with me when we moved to this cottage two years ago. I had no idea if it would survive, but survive and thrive it has. Lovage has a strong yet subtle flavour, a little like celery but nuttier, and makes a wonderful simple soup. Saute a chopped onion in some sunflower oil until soft but not browned. Chuck in a couple of chopped potatoes and a small handful of roughly chopped, young, fresh lovage leaves. Add 500ml or so of vegetable stock, and simmer for about 20 minutes, or until the potatoes are soft. Whizz in a blender until almost smooth, but still with a little texture. Add more liquid (stock or water) if needed. Season to taste. Add a swirl of cream or yoghurt if you fancy. 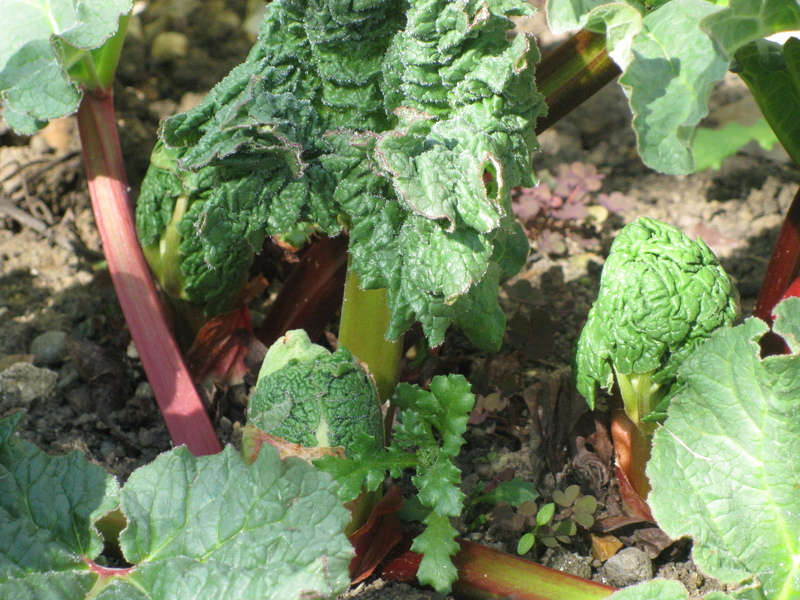 I am determined that our vegetable plot will be more productive this year than it was last (my fault entirely) and I have already got more than my five-a-day under way. 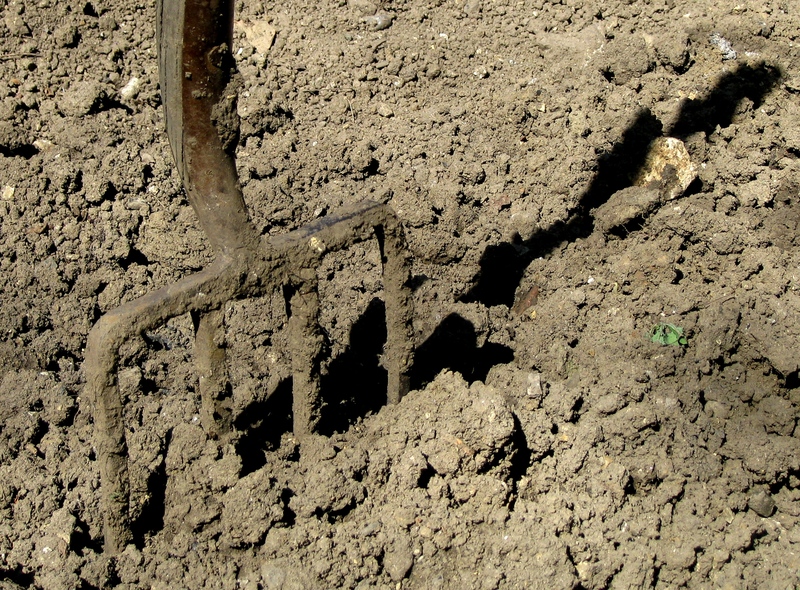 We have rich soil which is full of juicy worms so there is no excuse! We live in the driest part of the UK though, so I will be calling on my three water butts to keep my seeds watered as they grow. Although my husband and I walk every day with our dog, there is something special about a Boxing Day wander. After the over-indulgence of Christmas Day, one feels so virtuous, striding out across footpath and field the following morning. The day greeted us with a fine frost and pale, thin light. The sun fought a losing battle to emerge from the grey. In this mainly monochrome landscape, muted colours tell of seasons past and seasons yet to come. 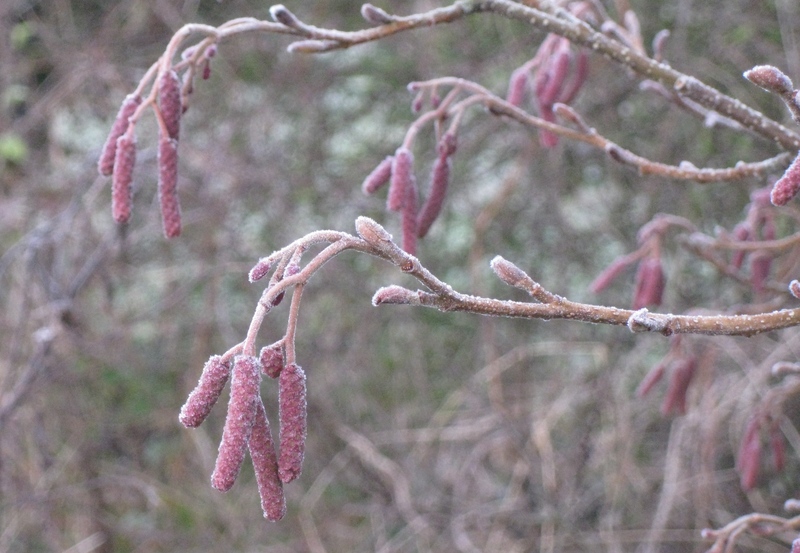 Leaves frozen in time, catkins shivering on bare branches and seed pods holding new life. The hedgerows that over-flowed with blackberries a few weeks ago, allowing me to fill my store cupboard with jams and jellies, now hunker down for the winter, silently regenerating within. 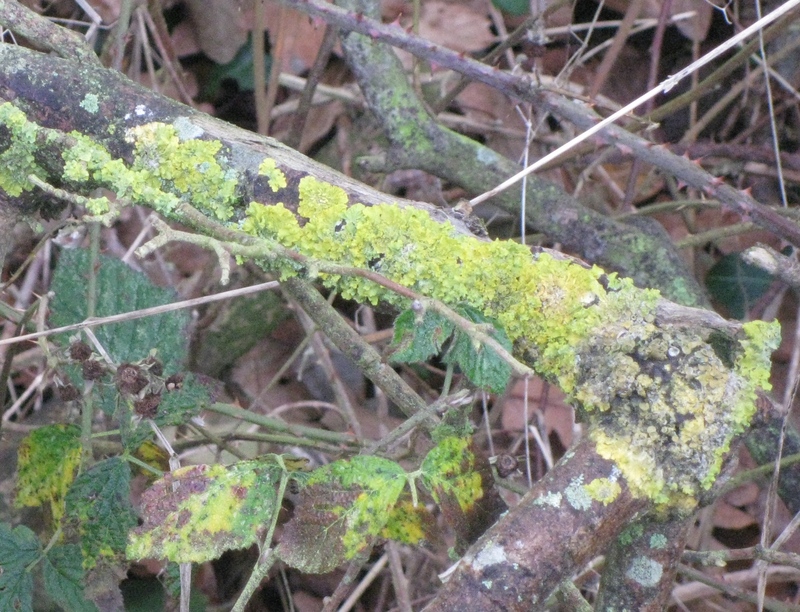 Patches of bright green moss and yellow lichen shout out from old tree stumps and branches, vibrant reminders of the colours of spring. 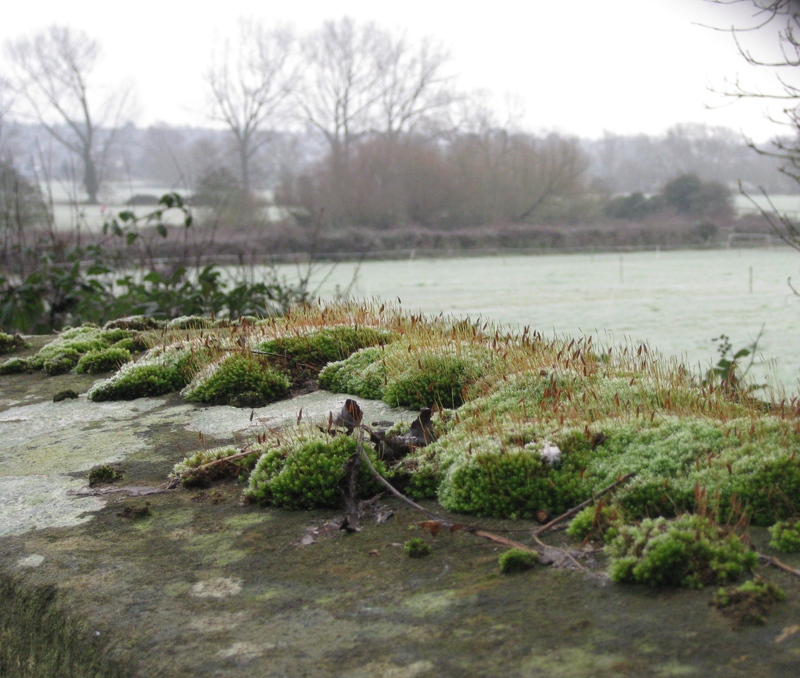 On top of a wall, overlooking the paddocks of a local livery yard, was a tiny landscape, fashioned in moss. 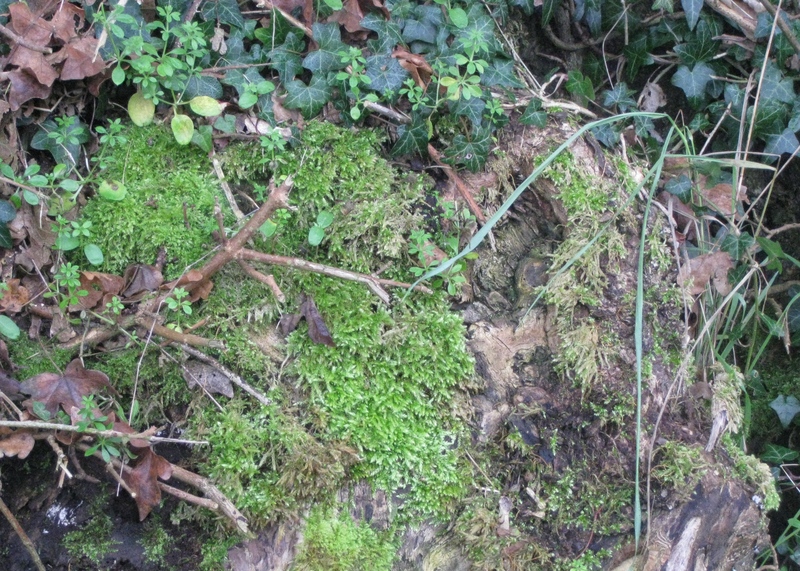 Hillocks and plant life in miniature, looking lush and verdant, as the full-size world will be again before too long. The Cheerful Cancere… on Well, hello again! cornelia on Well, hello again!